Bill Seaton shares this 1947 picture from the Chipley private daycare. 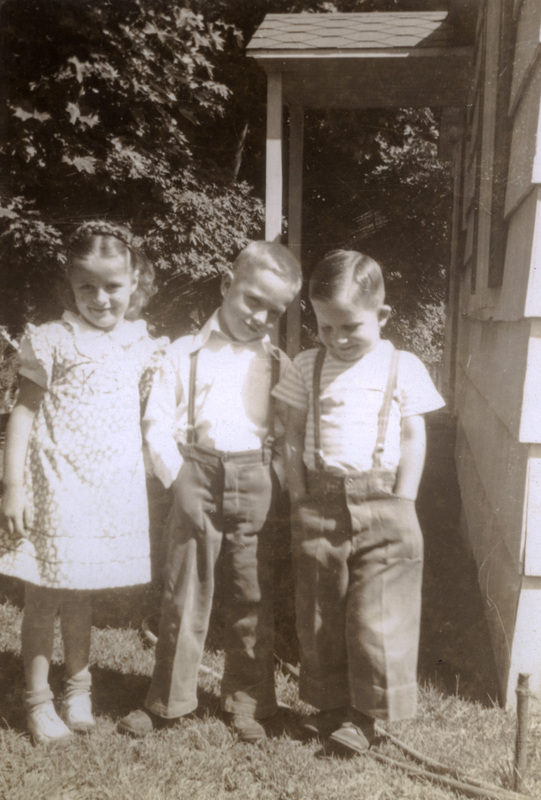 From the left they are Karen Sue Chipley, Bill Seaton, and Fred Duckwall, though at the time is was "Freddie" and "Billie". Thanks to Bill for sharing these fun pieces of history. We'll see some more later. Remarkable photo of all three. Good family friends with Chipley's. The father was a school teacher here in H. R. and the son John was an excellent football player. Here a few years ago I ran into Karen Sue and we had a nice visit. Yes, thank you Bill for all those "old and good memories." ah memories of the Chipley family.....father John L. worked some with the father as a Deputy Sheriff.....Chipley was short and the "crooks" always gave him trouble. also as a principal he was not one to get in trouble with....corporal punishment (yes, personal experience)....I think he was our principal at Park Street. Arlen is correct, John Chipley became principal of Park Street School the beginning of our 4th grade year in 1950. Interesting aside: John Chipley was a spear-carrier in the first production of the Ashland Shakespeare Festival. My memories of the Chipley family relate to John the football player. He was a senior and I was a freshman. At practice 5 days a week, all I remember were elbows and knees running over me. There was a reason they called freshman cannon fodder in those days. Is Karen’s name stitched on her dress? I’m thinking the photographer told the boys to put their hands in their pockets to get them to be still long enough to take the picture. It looks like Freddie has some comfortable trousers! And pants to big so there is lots of room to let out the hem as he grew. Freddie's parted hair is pretty spiffy looking. Arelen....I was looking through old editions of the 1914 HR Glacier and came across a June announcement for the "simple but pretty home ceremony for the wedding of Miss Ella Everson and John H. Sheldrake". L.E. my grandparents.....John H. and Ella......I will need to look your reference up. thanks!